Reports using fixed overflow maintain the size and position of the report object from Design View in the report output. Fixed is the default overflow behavior for all reports. You may customize and maintain the fixed overflow of the report output by adjusting the size and position of the report on a special overflow page. The following is an example of how to customize the Overflow for a Fixed report. Select Fixed from the Size and Overflow drop-down list. Note: Fixed is the default selection. If Not Set is selected, Fixed is used as the default. Right-click the fixed report in the Design View and select Customize Fixed Overflow. The overflow page is added after the page layout in the Design View, displaying a copy of the fixed component (with the original size and position) from the page layout. Scroll down in the Design View until you see the overflow page. Resize the report to fill the page. You may also optionally reposition the report overflow. 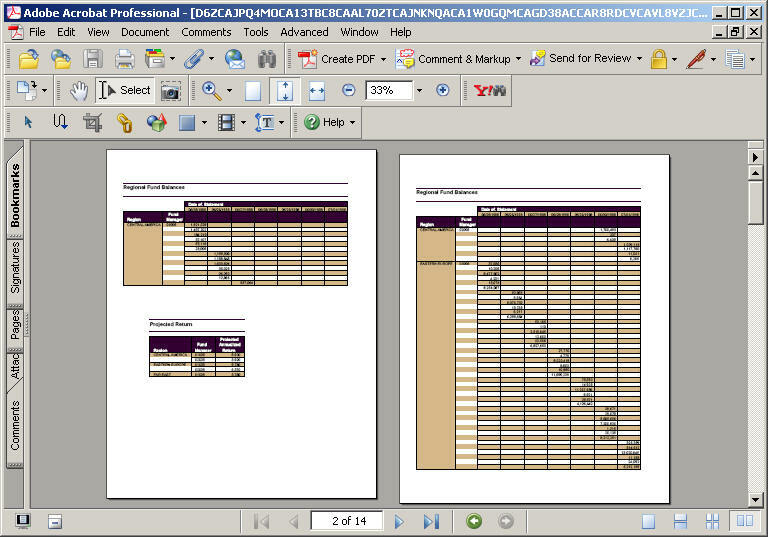 Note: If the document contains multiple fixed reports, the report output maintains the same size and position as the report objects in Design View, as shown in the image below. Note: If the document contains a fixed report and a graph, and the report is broken up around the graph object, you must set the relationship between the graph and the report if you want the graph to follow the report. For more information about setting relationships, see How to Relate Surrounding Objects to a Report.